Amazingly wonderful soup. It tastes decadent. Thanks for this and all your wonderful recipes! Mmm-mmmm! Delicious! Everyone enjoyed it thoroughly, including my four-year-old daughter. So easy to make, and no special ingredients to buy. Very easy to make! This soup is fantastic! I used 6 1/2 cups homemade broth, 2 leeks (white part) and 2 celery stalks. I also yellow peas instead of green. I grew up on the stuff. Hubby said it was a seller! I make this ALL the time. I do not saute the onions but throw all if in the crockpot and cook on low for 8 hours and it comes out perfect. I also use ham shanks instead of hocks when I'm taking it to a potluck so that it has ham chunks in the soup but the fat content makes the soup on the thin side. LOVE this recipe!! Hmmmmmm, just made this for dinner. Gina, it is heavenly!! I am craving legumes at the moment, it just hit the spot perfectly! Thanks so much for the recipe! Awesome soup! Thanks so much! Wow! This is cooking right now and it is fantastic!!! Thank you so much, another wonderful recipe! My hunny threw out the ham bone 🙁 but i have alot of left over ham from thanksgiving… you think i can use that instead? Hey Gina, this looks like a great recipe, and it has me asking you to see if you know. 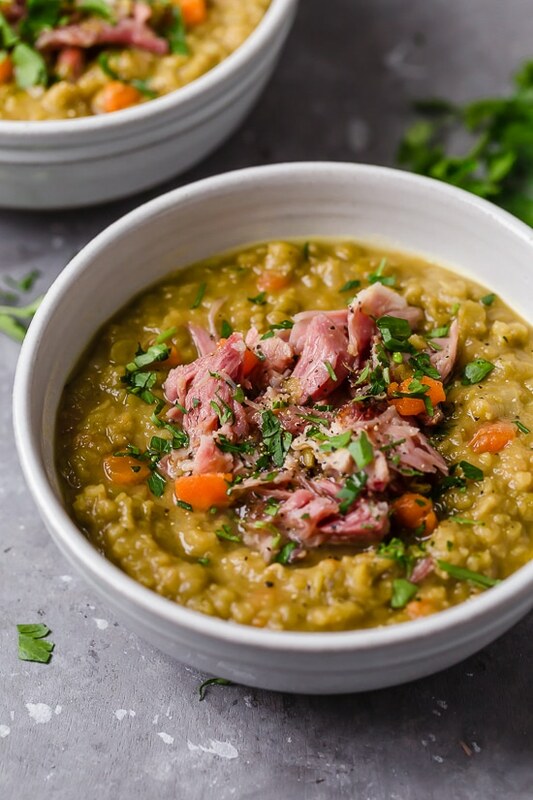 I love putting ham hocks in my soups for flavor, but have recently been afraid and wondering if just by sitting in there to flavor the soup any of the fat goes into the soup? Or if I remove it all should I be ok? Appreciate any knowledge! Thanks! My soup did not turn out very good. My peas never really got soft and I cooked the soup for at least three hours. Do you know what might of happened? My soup looks like lentil instead of split pea. I will definitely try this again! I'm still learning the whole cooking thing! I just made this the other night and I thought it was delicious! I didn't have a ham bone so I used a large package of chunked ham all ready to go and it came out perfect. I made this recipe minus the ham hock because I dont eat meat. I substituted with bacon bits that i soaked in the soup as I cooked it (tied them into a coffee filter since I didnt have a cheese cloth on hand!). It came out really well but my only concern is that when I went to calculate the points plus myself, 6 servings was 6 points plus. I divided it further because I usually like to keep my soups around 4 points, so I ended up having to make it into 8 servings for 4 points plus. Luckily the soup was thick enough to add more water so I could divide it out into that many servings. I made this exactly as instructed. 10 out of 10. Nobody would ever guess this was a healthy version. It's as good as my Mama's family version. Wonderful. Thanks for posting. Wonderful Soup with a great texture! I used 1/2 cup less chicken stock and did not use salt (bc Ham hock is already so salty) and it is delish! 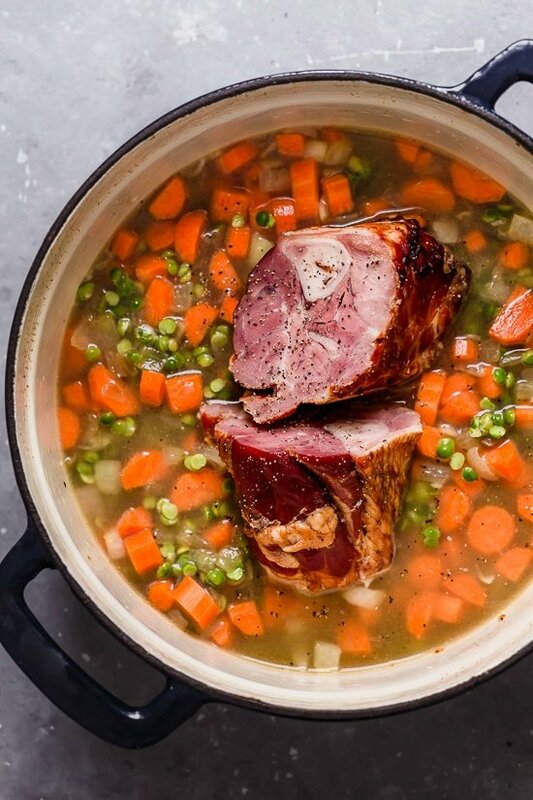 Great to make after you have a leftover ham hock from Easter. I love this soup, I use a pork shank, oh mannn it is good!!! This is delicious. I used canadian bacon as that was the closet substitute I could find at a very picked over grocery store. I also used the mirepox from trader joes (which has celery in it). After I pureed I sprinkled a bit of cumin in because nearly everything in the world tastes better with cumin. Yum! I think it's about ten cups when I make it, which is about 189 calories per cup. I also use smoked turkey neck and just throw it out after I'm done simmering. This is the first time I made pea soup. This recipe is easy and delicious so it is a keeper. I added a couple stalks of celery too. Yum. Made it tonight! Fantastic! My picky two yr old loved it! I blended it at the end with an immersion blender so it would be creamy like in the pic. Used leftover spiral cut ham- trimmed lean. Was fantastic. Served with grilled cheese sandwiches to hubby and daughter. I had with a small side salad. Perfect. Thank you! This soup is outrageously delicious. I did the points+ using the calculator and came up with 7.6 points per serving. The split peas alone were 45 points for 16 oz. Is there something different about split peas that we don't know about?????? When plugged into the recipe builder I get 6points plus including the ham meat. Still a delicious and filling soup for 6 pts! I LOVED this soup, but now I'm bummed. After reading Sonia B's comment, I, too, entered the ingredients in the the WW recipe builder and 6 servings = 6 plus points…and that's without adding the ham!! I think you need to adjust the number of servings on this recipe to come up with 4 points per serving, especially if you're adding the ham bone. So excited to make this. Does it freeze well? Thank you so much for your yummy recipes. I just made this soup so I would have a good healthy something in the fridge for lunches while I am home this week. I used leftover ham from Christmas dinner yesterday. It turned out delicious. I added a little Thyme and red pepper flakes plus an extra cup of water. DELISH!! We doubled the recipe so we could use the extra for lunches. It didn't make it to the end of the week, we all took it for lunches. It was so good. This will be going into our winter meal rotation! So hearty and rich! Thanks you for the service you do for us on our weight loss journey! This was my first time making split pea soup from scratch. This recipe was so easy and so good! I did cut the ham off the hock before tossing as I like a bit more protein. This one is a keeper! Thank you! Your blog is great–thanks so much! I think that adding celery is good in this soup and what are the points minus ham as I dont eat meat? I just started getting your newsletter every day about 3 months or so ago. 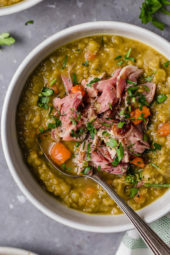 I came across this split pea recipe. It is one of my favorite soupds so I tried it today. It is amazing. Perfect balance of ingredients, really tasty. I had never had split pea soup before, but it is delicious! I made this recipe in my slow-cooker and it was waiting for us when we got home. A-MAZING! I made this over the weekend and it delicious! I couldn't find a ham hock, so I used a pork shank – which still gave it that smokey flavor. I didn't want to waste the meat, so I cut it off and added it to the soup. Thank you for all the great reciepes!! Hi Gina, I just made a recipe of shredded ham and have several cups of the broth left over. Do you think that I could use this ham broth instead of the chicken broth? Since ham is so much saltier, should I do half ham broth, half water? I don't want to waste this broth, but I don't want to end up with an over salty spit pea either. 🙂 Thanks so much for your website, I love to peruse it on the weekends as I drink my coffee and I have fixed many of the recipes. we had this last night for dinner. i used ham rather than hamhock. it came delicious.it was so good my daughter and i have two servings each for dinner. i am look ing forward to eating this soup for lunch today! 🙂 thank you for another wonderful recipie!! I have yet to try your recipe. 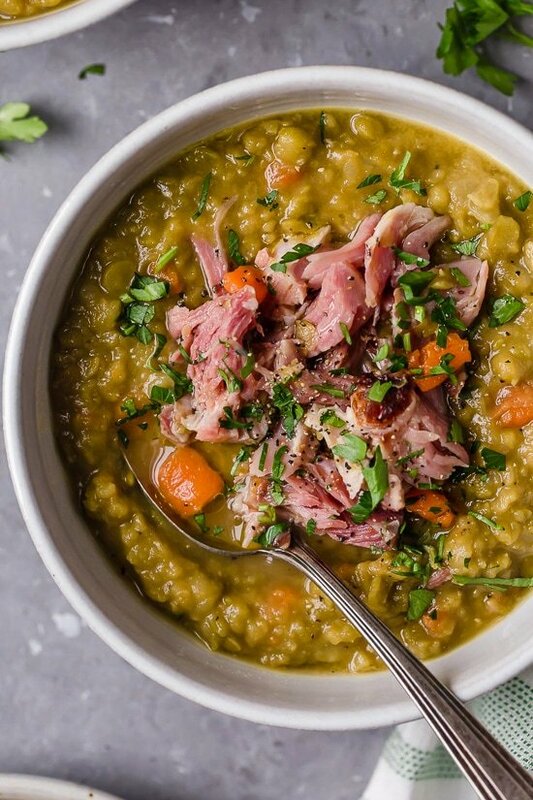 I've made pea soup w/ham hock before, using onion, potatoes, carrots, bay leaf and some whole allspice. Sometimes it has a bit of an aftertaste, and I don't know why. Would you have any explaination? Fantastic recipe once again. I've never made split pea soup before but I love to eat it! I followed the recipe but added celery with the onions. I didn't have a hamhock but I did have leftover smoked ham from a family dinner. I placed large pieces of the smoked outer casing (with some meat attached) in the pot and let it cook with the soup. The soup was amazing, it had such a fantastic flavor. Even DH, who is always skeptic of "diet" food loved it. Gina- Thank you so much for all of your inspiration. Your recipes make "dieting" a lifestyle and I think remove the stigma of diet food! These recipes can be cooked by anyone and they are beyond delicious. I can not eat ham do to not having a gall bladder anymore would the work with chicken? Hi Gina, this sounds so yummy that I'm itching to try. I saw the comment about doing this in a slow cooker – adding 6 cups of water and cooking on low for 6-8 hours. 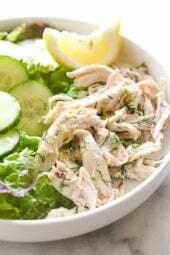 With this, are you omitting the chicken broth? This was such a great recipe, thanks for sharing! Making this again, needed some easy lunches for the week. I can't wait for lunch tomorrow!! Thank you Gina…. I make this also I put it in the crock pot I put beans (not soaked) grated carrots, chicken broth, and a turkey ham that I cube up, onion and 2 tbls oil. my grandson does not like soup, but, he ate two bowls Now when he comes over it has to be on the menu for him. I crock it for about 8-10 hours. made this soup tonight. Delicious! followed the recipe exactly, no need to change a thing. Thanks for another wonderful recipe! I love your site. I didn't think I could have fun cooking while on a diet. Your site has made dieting fun for me! I have a stack of recipes I can't wait to try! Thank you! Your recipes are wonderful. I made this soup yesterday. Amazing! I used a left-over frozen ham bone that was about 5 inches long with lots of ham on it. I removed the bone and all of the ham from the soup when done. My question is – do I need to add more points because of the ham bone? I measured the soup and got a little over 8 cups. Thank you Gina for this website! This soup was amazing!! 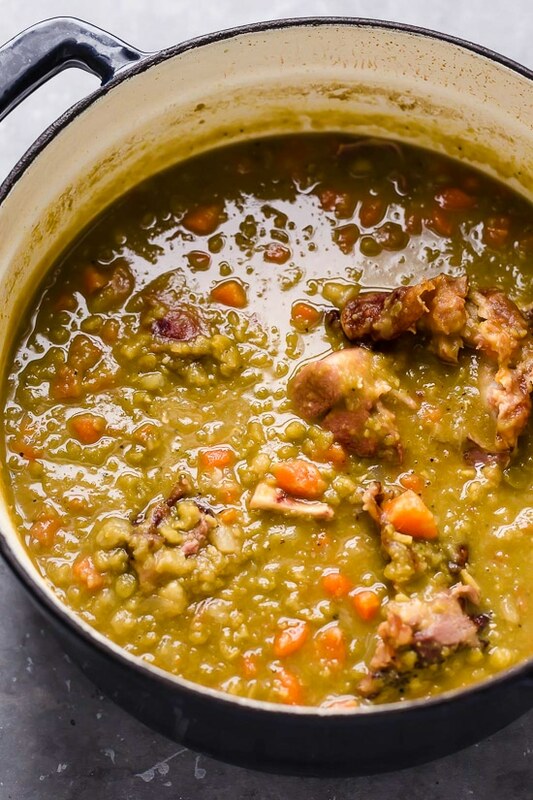 I had never eaten or made split pea soup before, but my husband is a fan and my sister recommended your site to me. Thanks for the GREAT recipe! I added some chopped ham at the end and served the soup with some garlic breadsticks. Next time (and there will definitely be one!) I'm going to try it in the crock pot. Oh my God! You don't have to be on a diet to absolutely adore this soup! I just finished a huge bowl of it and, to be perfectly honest, it's the best thing I've ever tasted! Didn't have ham hock so I added some diced slices of ham at the end and it was brilliant! I ate it with some crusty buns I baked yesterday…delicious is such a weak word for it, hihi 🙂 Thanks a lot, Gina! Your website is saving me every time I lack of inspiration 🙂 keep up the greaaaat work! This soup is AWESOME!! and really easy too. Thanks! I made this soup a few days ago and it turned out wonderful! Very easy and great on points plus for how filling it is. We added some hot sauce for a little kick. Can I say… TO DIE FOR!!!! My husband and I couldn't believe how unbelieveable this was! I am so happy to have found this! 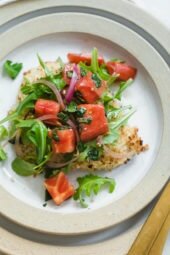 4 ww points…so easy and FULL of flavor! WINNER in my book! LOVE your blog…thanks so much! Thank you for the wonderful recipe, it was a good soup. I made mine in the crock pot, because I just wanted to cook all day and really get the flavour of the ham bone. If I wanted to just add ham, how much ham (diced) should I add? Yes, it's 3 points plus without the ham hock. Anonymous, every little bit helps! Hi Gina, I'm making your dad's cauliflower soup right now! 🙂 Can't wait to try it…but I really want to try this, also. I'm not sure if you can help me out here… I love split pea soup. But I'm also vegetarian. Obviously I can just leave the ham out and substitute veggie broth for chicken broth… but do you know if this will change the point value any? thanks!! I made this last night, and brought it for lunch today for myself and a colleague. It is deeee-licious! Thank you so much, Gina. I added very little salt, but let the ham hock sit in the soup while it cooled off and that probably upped the saltiness. I haven't updated this to points plus yet which is probably why it's higher. Hi, I am looking for WW friendly recipe and I've made your stuff before and loved it. I was inputting this recipe into my recipe builder and the peas alone was 32pts+ and if you divide that by 6 it's 5pt+. That doesn't even include a ham bone. Do you know why my points are so much higher? "16oz dry split peas"
Seeing as how its blizzarding & -30 out at the moment, I'm going to go throw this on the stove!! It's become my favorite Make Ahead lunch for the week… along with your Chicken Taco Chili!! Thanks again for all the amazing tasty recipes, we eat at least 5 'Gina's' a week! Turkey bacon works well, too — and then you get little pieces of crispy bacon in the soup. Yum. This recipe sounds delicious. One of my local meat markets also sells ham hocks that are HUGE, with lots of meat on it. I just add a few extra points per serving. this recipe works well in the crock pot. I use 2 smoked pork chops very lean. Ham bone or ham hock seems to be a big question here. I just made the soup and it is amazing. Tastes just like the old fashioned one my Mom makes. Anyway, here in Canada a ham hock/pork hock as a LOT of meat on it. So, does the meat go into the soup or not ?? There is some ham on a ham hock, not much though. It give the soup a great intense ham flavor. The sell it separate. If you can't find it, a small ham steak or leftover ham bone would work fine. this is stupid but… is a ham hock just a ham bone? (the large one) can you buy that separate or do you have to buy a ham first (and pick it off the bone? So i'm assuming this soup doesn't have any ham in it – just the ham flavor from the bone? thanks! You can although I never have. I would use 6 cups of water instead and cook on low for 8 to 10 hours. Can u make this receipe in the crock pot? If so, would you do anything differntly? Thanks! Great suggestions. I love love love collard greens, especially cooked with ham hocks. And yes, I agree, I discard the bone and fat, any ham that's left is yummy! 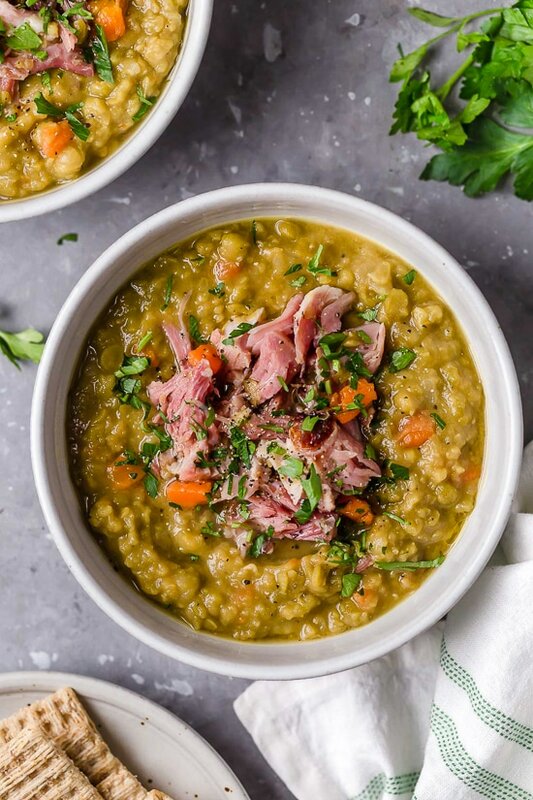 This is a pretty good split pea soup recipe, and in fact a pretty good base recipe for other types soups. 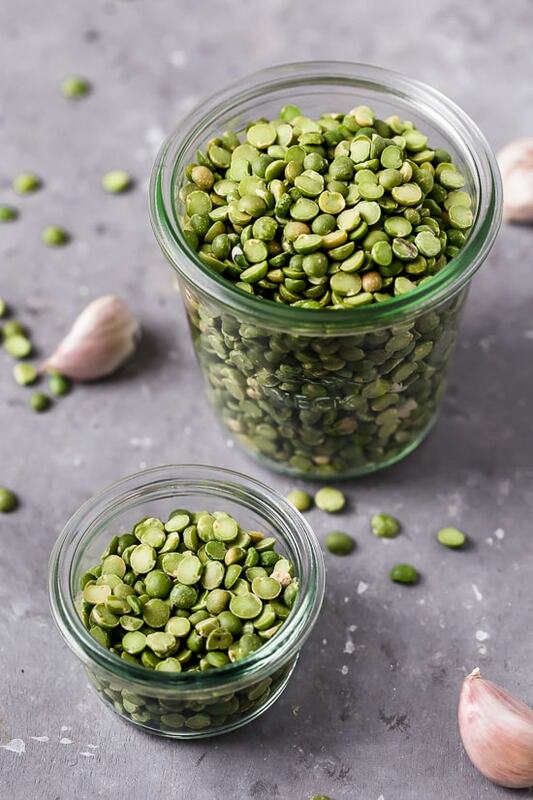 Just replace the split peas (and carrots) with just about any other type dried pea or bean (leave in the carrots with navy or great northern beans), and you have a great soup. If you use mixed beans, like in a 16 bean soup, add a couple of tbl of lemon juice about 15 minutes before serving. Here in the South, we remove the meat from the ham hock after cooking and put the lean meat back into the pot. I also keep a container or two of Ham Base in the pantry and use it instead of meat for seasoning. Really reduces the points in a recipe, just add 2 or 2 tsps instead of a ham hock. By the way, the base recipe really makes great greens, especially collards, my favorite! Oh that's so nice to hear! My hubby and daughter aren't dieting either, so I really need to cook real food. Thanks for the comment! Oh my god this was to die for. I just love split pea soup I am Mexican and this just brings back memories of how my mom use to make hers. I also love the rest of your other recipes have not made them all but I am very well trying to. I have to say they are all very flavorful. My hubby loves it and he is not on a diet but he loves the flavors in your dishes. He even sends me a text to find out what is on the menu for the evening….lol. So again please keep it up this site is awesome. My mom made this when I was a kid too, with croutons! 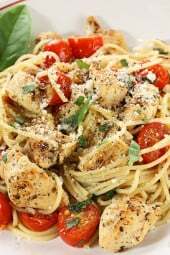 This was the first of your recipes that I have made and I loved it. Brought me back to my childhood…Mom used to make split pea soup. Trying the crock pot chili this weekend. Yes, 3.5 pts for 9.3 oz. New to the site and diet. Just made this recipe. It was absolutely fabulous. So excited! Just to get it straight: One serving would be 9.3 ounces which would be 3.5 ww points? Is this correct? Honestly, I think my error is that it serves more than 6. Not sure… Or the ham hock which is mostly bone? Hmm, I haven't calculated the points for this in over a year. To be accurate, I'll make this recipe again and get the exact points, servings and serving size. It's really the only way I can do it right, plus I get to have split pea soup for dinner again 🙂 Sorry if I made an error! I made this soup last night and it is Delish! But this morning I'm trying to add it to my Weight watchers recipe builder. I can't have toast or anything and I wanted to put the recipe in my favorites, when the WW recipe builder counts this, they are saying for 6 servings, this is 6 points. Is this about a cup/serving? Yes, anything smoked would work, even some ham just to get the flavor. Great soup and terrific hunger pain vanisher. If you make it with smoked turkey legs or wings it will have less fat than a ham hock be just as delicious and have less points. This makes about 7 cups total. So one serving is about 9.3 oz. I like to know how much is in a serving when I make soups, or stews. Measuring out the servings from a batch of something is a real drag for me. I like to cook, and serve right out of the pot, and when in a hurry, I tend to put the entire pot in the fridge, and serve myself up a bowl at the end of a busy day. Can you give an idea on the amount/serving? This is really good! I made the recipe on Sat. and froze some of the servings. I went to the store today to get another bag of peas so that I can freeze additional servings. Jennifer, you are right… 8 cups broth to 2 cups dried peas. Smoked ham hocks give it great flavor, you discard the bone when cooked. Gina–2 questions about this recipe. First–I’m not familiar with quarts as a unit of volume in recipes. Googled it and a quart is typically equally to about 1 L, or 4 cups of liquid. This soup only makes 6 servings, so clearly that’s far too much liquid. Can you clarify? Second–I have never ever used pork hocks for anything–It’s obviously used to flavour the broth here, but does it get eaten as well or just discarded? Thanks for clarifying–really love all the recipes you post! It’s 1 lb or 16 oz. What size bag of split peas do you use? I bought them in bulk and don’t want to mess it up! Thanks! This is the most appropriate soup to eat when it’s freezing outside. Here in The Netherlands it’s a custom for decades to eat this soup after riding iceskate outside. This soup brings warmth to you.